Anyone who saw the word ‘football’ and decided against last night’s talk missed a first rate presentation! Andrew Tobin told us how, some ten years ago, he had set out to become a sports photographer from club photography. The story of how he achieved professional accreditation via the publication of his first image in the national press up to his coverage of the final of the 2014 Football World Cup was absolutely fascinating. Andrew is a very engaging speaker and the images quite stunning. 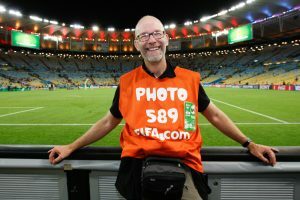 The background story of how he learned where to stand for the best shots, which sort of pictures get picked, which pages of the papers it is best to get published on, the hoops he had to go through to get cleared as a press photographer in Brazil and the inside story of being at the FIFA World Cup was spellbinding. A queue for a place in a queue for a seat, the mutual support and the underhand behaviours of other photographers, the kit and technology, the documentary photography he made outside the matches and the sheer pressure he had to work under all made for great story telling. As Peter Rocchiccioli noted in his vote of thanks, Andrew really brought the event to life, and his commentary on the necessary administration and the costs were a reality check. The second image taken just after the smiling portrait below of Andrew collapsed with exhaustion after his 18.5 hour day also brought home the immense pressure pro sports photographers work under. Andrew is a regular at camera clubs now – if you get the chance, don’t miss him even if you really don’t like football! A few reminders closed our evening, for both the Black and White Group and Digital Group meetings next week, the forthcoming 1st Small Print Competition for Club Class members and the deadline on Thursday 29th September for the Advanced PDI competition (see separate posts for details on all of these). And finally, we were pleased to hear from Don Baldwin who thanked members for the card. Don’s not feeling too good just now, but hopes to get to a meeting very soon and appreciated everyone’s good wishes. Sadly I missed the evening, does anyone know if he is talking at a club near us?